LED Bullet Turn Signal Insert Kit To Replace Harley Original Equipment Incandescent Bulb And Reflector. Published by Cyril Huze May 19th, 2016	in Customs, Editorial and Electrical. 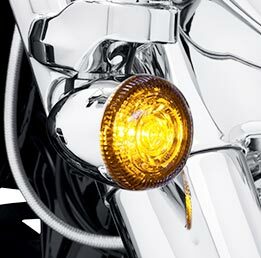 You can grab some more attention in traffic with the new LED Bullet Turn Signal Insert Kit (P/N 67800639 Amber, P/N 67800640 Red; $139.95) Designed as an easy, drop-in replacement for the Original Equipment bulb and reflector in a bullet turn signal housing, installation does not require a control box or load equalizer for correct operation. The inserts feature a single bright, fast-acting red or amber LED lamp sealed in a waterproof housing. The multi-faceted reflector amplifies the light, and the focused lens (sold separately) spreads the light across the lamp’s surface. 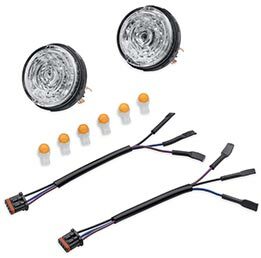 The kit includes two LED modules, two wiring harnesses, and crimping connectors and fits 2014-later Harley-Davidson® Touring, Trike and Sportster® models, 2012-later Dyna® Switchback™ and Super Glide® Custom models, and many 2011-later Softail® models. See an authorized Harley-Davidson dealer for fitment details or online at Harley-Davidson Store. Until Led’s are standard equipment on all models. Seems to me that, given the incredibly high prices on Harley Touring models, this should be standard. That’s what I hate about H-D. For $25000 or more they sell you a Motorcycle Starter Kit, but if you want it to perform competently (read: as well as Japanese cruisers or Polaris cruisers), you’re at least another $5000 spend away. are these items NOT standard equipment !!!!! for safer lighting on ANY brand of cycle ?? ?